All operations are aimed at keeping their machinery in prime working order. Any damage in a rotating assembly component of machinery (particularly a separation of a component or looseness) could result in excessive unbalance and high vibrations which can lead to an alarm or even an emergency trip. In case of any serious malfunction, the expectation is that the machinery comes to a safe stop (through an emergency trip) with the minimum possible damage. The rotating components could be in resonance with any machinery generated excitations. Particularly resonances for the first and second natural frequencies can be dangerous. Generally, there could be numerous cases of resonance; even some of them could be strange. For example, in a machinery, the second natural frequency of a rotating component proved to be almost exactly an integer multiple of the first natural frequency, which resulted in a serious excitation and an extensive damage. The fluid induced vibration, separation phenomena, oscillatory changes of fluid pressure and turbulent flow (vortex formation) might be cause of high vibrations or even a failure in some machineries. Individual resulting stress amplitudes should be analysed. The stresses should clearly be within acceptable limits, for instance, the fatigue limits such as a high cycle fatigue (HCF) limit or a low cycle fatigue (LCF) limit. Usually, a form of fatigue is involved in many rotating part failures and the failure can take place a short time after the commissioning. Because of high vibrations or extreme dynamic forces, some auxiliary piping of machinery could be damaged. The most critical one is the lubrication oil piping system. Any serious damage to the oil piping feeding the lubrication oil to the bearings could lead to the loss of oil flow and the destruction of the Babbitt in the journal bearing liner in a very short time (say around 2-5 seconds). A failure of a rotating part inside an electric motor could result in a serious short-circuit incident and probably an explosion. In case of an explosion or a very serious incidence, the machinery casing should fulfil the containment function. Structural damage to auxiliaries (particularly critical ones such as lubrication oil) is also of concern, and design principles should be in a way to ensure that the auxiliary piping, and electrical facilities will safely sustain the fault conditions. 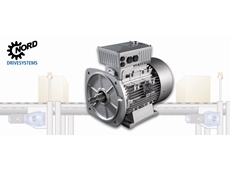 Mechanical: such as overhung load, bending load, torsional load, and axial load. Dynamic: vibration, cyclic, shock, etc. Residual: manufacturing processes, repair processes, etc. Thermal: temperature gradients, rotor bowing, etc. Environmental: corrosion, moisture, erosion, wear, cavitations, and similar. Based on experience, a significant number of failures can be diagnosed with a fundamental knowledge of shaft failure causes and visual inspections. This may then lead to seeking confirmation through a metallurgical laboratory. Table 1. shows the main reasons for the machinery shaft failure (just a rule of thumb). Table 1:Main reasons for the machinery shaft failure. There are other studies that suggest the fatigue caused failures are more important (even more than 50%). The failure mode is also depending on the machinery type and the application. For example, in some machines, the fatigue is reason for around 50-70% of all failed shafts. The origin of cracks caused by the fatigue is usually the presence of some surface discontinuities which commonly referred to as stress raisers. Examples of this on machinery shafts are keyways, steps,shoulders, collars, threads, holes, snap ring grooves, shaft damages or flaws that would produce a stress raiser (wherever there is a surface discontinuity a stress raiser will exist). The corrosion can also create stress raisers. For typical machinery, the two most common problematic places are at “the shoulder on the bearing” or in “the coupling keyway region”. 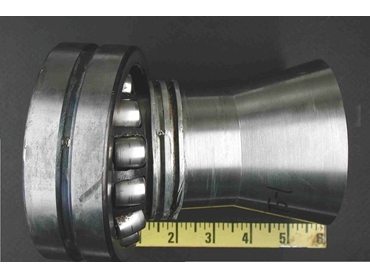 In the case of the fatigue caused by axial loads,the thrust bearing carrying the axial load would most often fatigue (often contact fatigue) before the shaft does. However there are numerous examples where the shaft is damaged before the machinery is stopped. Keyways are commonly used to secure rotating components, rotor cores and couplings to the shaft. The keyway on the take-offend or drive/driven end of the shaft is one of the most concerns because it is located in the area where the highest shaft loading occurs. Fatigue cracks usually start in the fillets or roots of the keyway. A keyway that ends with sharp step(s) has a higher level of stress concentration than a keyway uses a“sled-runner” type design. In the case of heavy shaft loading, cracks frequently emanate from this sharp step. A connection using any form of key should be avoided to the maximum extent possible. In special cases, when other solutions (non-key connections) could not be used, it is important to obtain an adequate radius on the edges of the keyway. The fatigue leads to an initial crack on the surface of the shaft. The crack or cracks propagate until the remaining shaft cross-section is too weak to carry the load. Finally, a sudden fracture of the remaining area occurs. Residual stresses or initial deflections are usually independent of external loading on the shaft. There is a wide variety of manufacturing or repair processes that can affect the amount of the residual stress or initial deflection, they include: drawing, bending, straightening,machining, grinding, surface rolling, shot blasting, and polishing. All of these operations can produce residual stresses and initial deflection by plastic deformation. In addition, thermal processes that can introduce residual stress and deflection include: hot rolling, welding, torch cutting and heat treating. Shaft fretting can cause serious damage to the shaft and the mating part. Typical locations are points on the shaft where a“press” or “slip fit” exists. The presence of ferric oxide (rust) between the mating surfaces (which is reddish-brown in colour) is a strong confirmation that fretting did occur. The cause of this condition is some amount of movement between the two mating parts and the oxygen. Once fretting occurs, the shaft could be very sensitive to fatigue cracking (could result in a fatigue failure). The shaft vibration can worsen this situation. 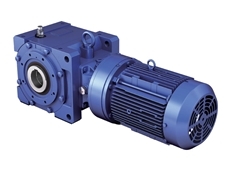 The case study is for a tragic failure in an electric motor diver of industrial machinery. An axial fan using 13 blades is used as a part of the electric motor cooling system to dissipate the generated heat. The fracture of cooling fan blades has been occurred just 160 hours after the start-up. The fracture of the electric motor blades caused a serious short-circuit incident between rotor and stator and consequently an internal explosion in the motor with extensive damages. An accurate FEA (Finite Element Analysis) modelling and proper investigations showed that the first natural frequency of the fan blade ~659 Hz(accurately-calculated after the failure) was very close (almost within 1.5%margin) to the frequency of the exciting force caused by the shaft rotation (13 blades × 50 Hz = 650 Hz). This resonance was the initial cause of the failure.Further investigations indicated when the fan blades were excited with 650 Hz frequency, near to the first natural frequency (659 Hz), the blades vibrated intensely and the stresses reached above 290 Mpa, which could be sufficient fora fatigue failure. This resonance and associated high vibration led to crack initiation/propagation, blade failure, the short-circuit incident and the electric motor internal explosion. The explosion was contained, but the damages to the electric motor were expensive and costly. 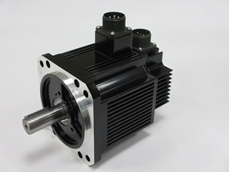 The lesson learned: a relatively-large (or medium size) electric motor could be custom-engineered equipment and accurate modelling techniques and proper analysis methods should be employed for all parts and components. The case study is about a rotor failure in a low-speed, small, manufacturer-standard machinery after only (approximately) 2000 operation hours due to a shaft fracture. The fracture was exactly at a diameter change section (a step) of the shaft. The fracture surface was smooth and perpendicular to the shaft axis. When the crack propagated to around 60% of the shaft diameter, the remained shaft section could not tolerate the applied stress and a fast fracture occurred. Experiments showed that the phenomenon responsible for this fracture was the fatigue. The clearance between the rotating parts and the static part was relatively tight. As a result of operational forces (unbalance,fluid, thermal and dynamic forces) the rotor rubbing was occurred which caused high forces on the shaft (extremely high bending moments and stresses on the shaft). Proper condition monitoring was not provided for this small machine and the rubbing was undetected. The main cause of fracture was the rubbing. This then led to an excessive fatigue cycle, resulted in fatigue failure of the shaft.